Tom Foolery at Its Finest: The Truman Show Redux : The purpose of this paper is to highlight how hegemonic American economic doctrine has infected global economics in creating a surreal plutocratic corporatocracy, or in other words, what’s black is white, what’s up is down, what’s safe is risky, you get the idea! "You know, Paul, Reagan proved deficits don't matter," continuing, "we won the midterms (congressional elections). This is our due." Judging by what deficits were then versus what they are now – roughly $1.5 Trillion annually – it’s evident that America continues to be “ruled” by the dictum that deficits do not matter. While deficits have “appeared not to matter” to America, they certainly have come home to roost in Iceland, Ireland, Greece, Italy, Spain, Portugal, France and now even Germany – with a recent failed 10 yr. bond auction - too. Ergo, deficits really do seem to matter to some countries – just not America – at least not yet. To keep the Truman illusion alive – and keep the namesake believing in the Carrey trade – a little sleight-of-hand is required. So, to prove to everyone that the U.S. financial system is still strong, the Federal Reserve has announced it is going to perform “stress tests” on six major banks. Regulators said they will publish full results next year of a bruising "stress test" of the biggest U.S. banks, in a bid to reassure investors about the health of the financial system at a time of intense market uncertainty. The six largest banks in the U.S. will be asked to gauge losses from a "hypothetical global market shock" related to the turmoil in Europe, the Federal Reserve said Tuesday. The Fed said that test "will be based on market price movements seen during the second half of 2008," when financial markets froze following the bankruptcy of Lehman Brothers Holdings Inc.
Ladies and gentlemen, the Federal Reserve is the producer of this Truman-esque fairy-tale. The U.S. Treasury is the set-director. Their stress tests – for banks – are just another scene in the movie. Five of the six of the referenced banks just happen to have derivatives books ranging from 53+ Trillion to 78+ Trillion in notional. 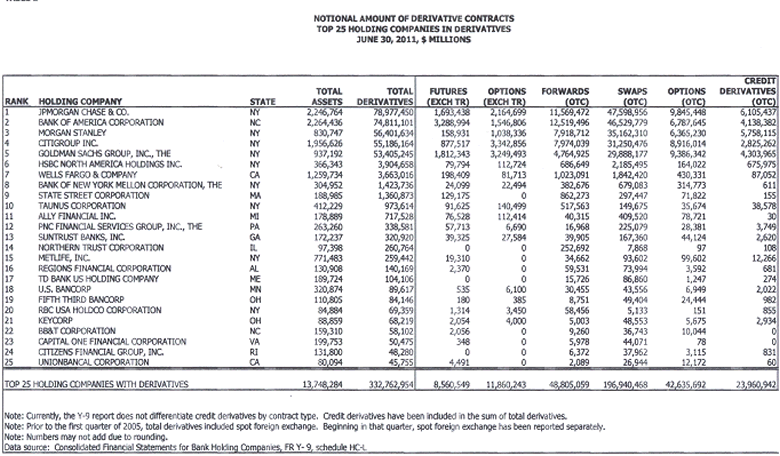 More than 80 % of these outstanding derivatives are interest rate contracts. Hundreds of trillions of these are interest rate swaps, with maturities of 3 – 10 years, which have physical U.S. government bond trades imbedded in them. This provides the ‘cover’ for these banks to purchase an unlimited amount of U.S. Government debt. Because the bonds serve as “hedges” for said swaps – they are not subject to ‘mark-to-market’ accounting. Synthetic Alteration or Settlement Accounting. Derivative instruments used to change the nature of one financial instrument to that of another financial instrument (such as an interest-rate swap changing floating-rate debt to fixed-rate debt) are accounted for in a manner consistent with the underlying asset or liability to which they are designated. As with interest rate swaps, any receivable/payable settlement is recorded as an adjustment to interest. The swap is not marked to market unless the related underlying asset or liability is carried at market value. If an interest-rate swap is terminated, any gain or loss is deferred and recognized as an adjustment to interest over the shorter of the remaining contract life of the swap or remaining life of the asset or liability. How many U.S. Gov’t bonds any of these institutions really hold [warehouse] is anyone’s guess? Suffice to say, so long as they can finance their holdings at effectively ZERO % - U.S. deficits should be NO PROBLEM in our hologram world – no matter how big they become. Let us also remember that Morgan Stanley – a bank holding company with a 25 billion market cap – strapped on 14 Trillion in derivatives in the most recent 6 month reporting period [Dec. 2010 – June 2011]. The lion’s share of that “add” was in int. rate swaps. These instruments require reciprocal credit lines between counterparties. To think that the American banking industry – in total – would have credit lines for Morgan Stanley – in a credit starved environment - to support a 14 Trillion “add” to their book in 6 months is as likely or believable as a grade four student winning 8 million dollars at school recess pitching bubble gum cards. Non-Truman Reality: Morgan Stanley [MS] is “paying fixed” in interest rate swaps - terms ranging from 3 – 10 yrs. – to the “receiver of fixed” – the Exchange Stabilization Fund or ESF [the U.S. Treasury] – trades brokered through the N.Y. Fed. The ESF does not provide MS with the bonds to hedge the trades and this forces MS into the bond market to purchase these securities to hedge their trades. To understand this process is to understand why German bond auctions can and do fail while American bond auctions WILL NEVER FAIL – even though China and PIMCO [world’s largest bond fund] NO LONGER BUY TREASURIES. "President George W. Bush has bestowed on his [then] intelligence czar, John Negroponte, broad authority, in the name of national security, to excuse publicly traded companies from their usual accounting and securities-disclosure obligations. Notice of the development came in a brief entry in the Federal Register, dated May 5, 2006, that was opaque to the untrained eye." What this means folks, if institutions like J.P. Morgan, Goldman or Morgan Stanley are deemed to be integral to U.S. National Security - can be "legally" excused from reporting their true financial condition – including KEEPING TWO SETS OF BOOKS. Does sanctioned dual-sets-of-books for select banks sound like something the framers of TARP, TALF, TGLP, TIP, CAP, CPFF, PPIP, AMLF and MMIFF would bestow upon us? The Federal Reserve Bank of N.Y. is named in official U.N. documents as the “fiscal agent” for the U.S. Treasury in matters relating to gold swaps. So, for Alan Greenspan to say, back in 1999 – to Ron Paul UNDER OATH – that the Fed is not involved, nor are they permitted to be involved in the gold market was, in fact, a PREMEDITATED DECEPTION OF CONGRESS. Dr. PAUL: Thank you, Mr. Chairman. Mr. Greenspan, a lot of economists look to the price of gold as an indicator and as a monetary tool. It has been reported that you might even look at the price of gold on occasion. Last summer on a couple of occasions here when you were talking before the committees on securities and on derivatives you mentioned something that was interesting. You said that central banks stand ready to sell gold in increasing quantities should the price rise, which I thought was rather interesting. Then I followed up with a letter to you to ask you whether or not our central bank might not be involved in something like that, in the gold market. And you did answer me and stated that since the 1930's the Federal Reserve has had no authority to be involved with the gold markets. Is Mr. Greenspan guilty of perjury? In Sept. 2009, in response to GATA FOIA requests, the Fed reversed course, in a letter dated September 17 and written by [then] Federal Reserve Board member Kevin M. Warsh, formerly a member of the President's Working Group on Financial Markets, detailed the Fed's position that the gold swap records sought by GATA are exempt from disclosure under the U.S. Freedom of Information Act. This is called sucking-and-blowing at the same time. We finally learned why the Fed changed its tune on this steadfast serial lie when it was publicly disclosed that U.N. had published materials documenting gold quality swaps between the Bank of England and the Fed/U.S. Treasury – linked here. We can only wonder if the stench of lies and deceit emanating from the Federal Reserve was the real reason why Governor Warsh resigned his post as “bagman” for the Fed back on Feb. 10, 2011. The Fed/Treasury have gone to extremes to perpetuate the Truman-esque perception of gold as a risk trade. In fact, gold is the safest, most liquid asset in the world. Gold derivatives [like swaps, futures, options], along with a pliable media, have been masterfully used to reinforce this myth. Rest assured, anything the Fed is telling us about what happened at M F Global is most assuredly NOT the truth. But, then again, in our hologram world – that is to be expected! In the non-Truman world – where banks are subject to real accounting - M F Global was probably selected for extermination to send a message to and strike fear in the hearts of those who would use their commodity accounts/COMEX as a means to procure physical precious metal [that would be pretend precious metal that does not exist outside of the Truman hologram]. The “just announced” new round of stress tests is another freakish skit in this ongoing Truman saga – designed to keep the now worried herd of Jane and Joe Sixpacks believing that “all is well” in our hallucinogenic land of debt-servitude. Stay tuned everyone, the ending of this motion-picture-show “heats-up” in a hurry and ends in a flash – so sad that there will be very few of us left to watch/read the credits. And that, ladies and gentlemen, is why I’m giving attribution now. The balance of this article is subscriber only. Copyright © 2011 Rob Kirby - All rights reserved.